The Short Version: Nestled in Sonoma’s Alexander Valley in California, Jordan Vineyard and Winery tempts couples with a tasty hors d’oeuvre paired with a smooth glass of wine. This family-owned winery offers food pairings with all of its wine tastings, so you can treat yourself to a mouthwatering experience in an upscale destination. Winery chefs pull ingredients from Jordan’s gardens and create refreshing dishes and hor d’oeuvres to go with the vineyard’s classic bottles of cabernet sauvignon and chardonnay. You can sample different vintages of the same brand of wine and compare the flavor profiles in the elegant wine cellar or private dining area. The Jordan Estate Rewards program gives wine enthusiasts a chance to upgrade their experiences to include intimate dinners, picnic lunches, and a weekend stay at the Jordan chateaux. Next time you’re planning a date, consider booking a tour, tasting, or dinner party at Jordan Winery. In the early 1970s, Tom and Sally Jordan often traveled to Europe to sample French cuisine and a bottle of Bordeaux. They loved food, and they loved wine, so it seemed only natural to pair those two passions when they planted a vineyard and started a small winery in California in 1972. Jordan Vineyard and Winery bottled its first vintage of wine in 1976, and the team has been perfecting its winemaking process ever since. Located in northern Sonoma County, just outside the happening food town of Healdsburg, Jordan Winery serves a classic cabernet modeled after a First Growth Bordeaux. The Jordans want their wines to be accessible and food-friendly to wine connoisseurs and novices, so their bottles feature soft flavors with less acidity than other California brands. Whether you’re looking for a place to enjoy an afternoon date or propose to your loved one, you will find an enchanting, laid-back, and intimate space at Jordan Winery. Instead of mixing and matching complicated taste combinations, Jordan Vineyard and Winery keeps things simple. They make two varietals of wine — one red and one white — crafted with precision and care. For the last 40+ years, the Jordan family has focused on old-world winemaking and ageing that brings out elegant flavors. 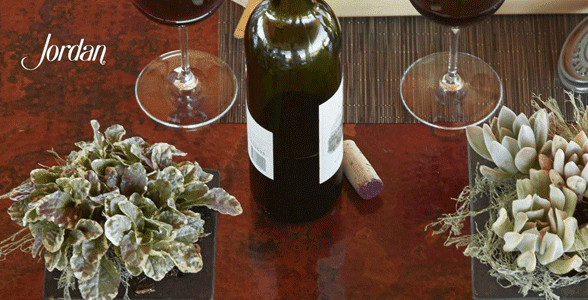 Guests can choose between Jordan’s silky cabernet sauvignon and its crisp, fruity chardonnay. The winery offers different vintages of cabernet during tours and tastings, so during food and wine pairings you can see how the wine’s taste changes over time. These high-quality vintages are expertly balanced to pair well with tour and tasting hors d’oeuvres, savory meals, plates of cheeses, and other culinary dishes made by the on-site chef. Jordan Winery is a perfect place to visit if you want an epicurean experience. Jordan’s Executive Chef Todd Knoll comes up with seasonal food pairings to delight the senses and accentuate the flavors of Jordan’s wine. He draws a lot of his ingredients, including 20+ types of heirloom tomatoes and six types of carrots, from Jordan’s one-acre garden plot. You can stroll through the estate’s gardens to see the strawberries, raspberries, figs, and melons growing as part of the Estate Tour & Tasting or the winery’s seasonal Vineyard Hike events. Jordan Winery has four tours and tastings available by appointment to couples looking to explore the vineyard and sample its best wines. The Library Tasting, available year-round except for Sundays during winter, includes a seated wine tasting in the cellar room. You’ll spend an hour sampling Jordan Winery’s current release Russian River Valley Chardonnay complemented by an hors d’oeuvr before moving to the cellar room for multiple vintages of Jordan Alexander Valley Cabernet Sauvignon with artisan cheeses and the estate’s olive oil. The tasting lasts an hour and always leaves guests eager to book a future tasting with a tour. 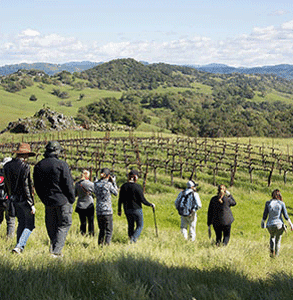 The spring vineyard hike gives couples a chance to see the mountains, lakes, and wildlife surrounding the Jordan estate. The Winery Tour and Library Tasting adds a half-hour tour of the iconic winery chateau to Jordan Winery’s private tasting. It was named among TripAdvisor’s Top 10 US Winery Tours. This experience is offered year-round except for Sundays December through March. The Estate Tour and Tasting, an outdoor excursion offered May through October, gives people a driving tour of the grounds with stops in the garden, by the lake for chardonnay and food pairings, and in the vineyard. The tour finishes with a superb cabernet sauvignon tasting and cheese plate on a hilltop with a panoramic view of golden hills, vineyards, and mountains. You can take in the scenic vistas of Sonoma County and enjoy an al fresco wine tasting paired with farm-to-table delicacies from Jordan’s kitchen. “It’s a three-hour movable feast,” Lisa said. Finally, the seasonal Holiday Tour & Tasting helps get guests in the spirit of the season with champagne tastings and decadent food-and-wine pairings, complete with homemade hot cocoa and freshly backed cookies for dessert. This experience is only offered on set days between Thanksgiving and Christmas. All Jordan Tours and Tastings are offered by appointment and require advance reservations. Pets, infants, and other guests under 21 are not allowed during these seated food-and-wine pairing experiences. Jordan Winery also organizes unique events to tempt people to pay them a visit. Whether you enjoy making gourmet s’mores on a fire or picnicking on the terrace after a hike through a flowery meadow, you’ll be satisfied by the winery’s summer dinner parties, vineyard hikes, and other seasonal events. You can earn points through the Jordan Estate Rewards program to earn private tastings, private meals, overnight stays, and preferred pricing on winery event tickets. Once you’ve spent $500 at Jordan Winery, you become a Silver Member and can earn rewards such as harvest lunches, Champagne & Caviar Tasting, and a Private Tasting with Hors d’oeuvres. Couples can laugh, chat, and relax at Jordan Vineyard and Winery. This 1,200-acre property provides sweeping views and a peaceful respite from life in the city. You can go on a hike in the spring, summer, and fall, and get an up-close look at the vineyard or attend a dinner party and indulge in classic culinary dishes paired with tried-and-true bottles of wine. Plenty of couples have gone on dates at Jordan Winery, and some have even had their proposal story there. Lisa said the team will gladly plan a custom experience to accommodate someone looking to propose. Silver members of the loyalty program can arrange a private tasting and get down on one knee in an intimate setting. Dave Butterworth said he and his wife celebrated their 24th wedding anniversary at the Jordan Winery and were thankful to the staff for going out of their way to make the day special. 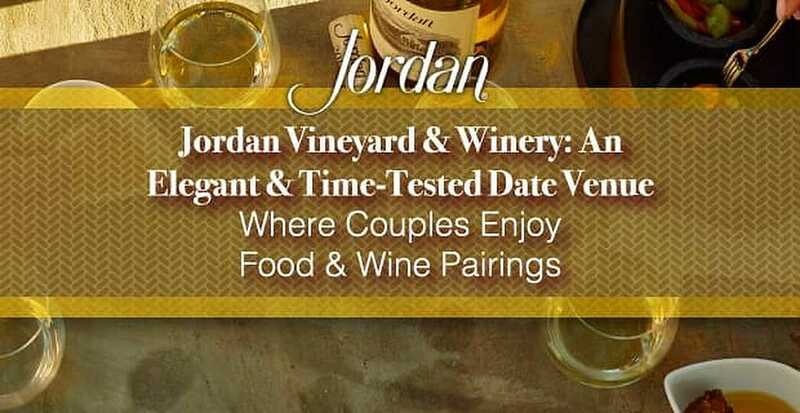 At Jordan Vineyard and Winery, you’ll see couples of all ages — some who discovered the winery on social media, and some who have been going there for decades — mingling in a relaxed atmosphere. The winery’s focus on providing a top-notch culinary experience sets it apart from other vineyards and wine cellars in California. Jordan Winery won’t just give you an award-winning vintage; it’ll serve you gourmet food pairings made with fresh ingredients from its own gardens. Couples can get away from their daily stresses and indulge their senses in a world-class tasting and tour at Jordan Winery. It’s a wonderful way to share a laugh, give yourself a treat, and make a lasting memory in the mountains of California.